Professor Emeritus Peter Volten has been awarded Doctor Honoris Causa of the National University of Political Studies and Public Administration (May 2014) in recognition of his outstanding contribution to the field of European Security Studies. Leading author, director and editor, Prof. Volten has kindly accepted to publish his lectio prima as editorial essay in the current issue of Europolity. THE UKRAINIAN CRISIS SEEN FROM A REGIONAL PERSPECTIVE: ISOLATED CONFLICT OR DRIVING AGENT FOR REGIONAL SECURITY DYNAMICS? Ever since last year’s refusal of former Ukrainian President Viktor Yanukovych to sign the EU Association Agreement, there has rapidly been unfolded a series of events leading to an ongoing internal crisis and regional security issue. The growing trend of this development has revealed the lack of rapid and effective structured response by the West to deal with the continuing crisis. What are the reasons for which the Trans-Atlantic community’s efforts have not met the expected results? The current paper seeks to show that the Ukrainian crisis is linked to other regional security issues, which, as consequence of their inter-connectivity, attract the Wider Black Sea cluster of states into a process of regionness based on security matters. In order to provide evidence in this regard, the paper will look through the Regional Security Complex Theory’s reference factors’ lenses to analyze the reactions of the regional states based on patterns of amity-enmity, “weak”- “strong” typology of states, and the modalities through which the conflict has reverberated across the region enabling security dynamics. The employed methodology is partly based on content analysis and partly on discourse analysis. The findings of the paper reveal that the Ukrainian crisis influences and is influenced by the overall security dynamics in the region, and the inter-state relations, respecting a pattern of long-lasting relations of amity-enmity, and power relations. In the summer of 2013, the European Endowment for Democracy – EED started to operate from Brussels, as the newest additional instrument meant to project EU’s influence in its neighbourhood. Its objective is to encourage democracy initiatives from the emerging civil societies and to support the political transition in the East and South, within the geographic scope of the European Neighbourhood Policy. This article is examining the sui generis nature of the Endowment, a private foundation created and managed by the EU institutions and Member States, established as a result of ad-hoc negotiations within the EU framework, with innovative governance and operational models, and a hybrid budget provided by the European Commission and national voluntary contributions. It gives a description of the context in which the initiative appeared, and of the process that led to its creation. 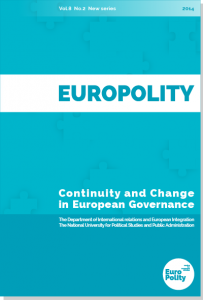 The analysis includes the inception phase of the Endowment, and the decisions of its governing bodies that led to autonomy from the EU institutional setting. It explores the added value of the EED by examining the new categories of beneficiaries that it can finance, and the new types of interventions, both not covered by other donors of assistance for democracy and human rights, as well as the methods it uses in order to increase the flexibility of its operations. In addition, there is an emphasis on the complementarity of the EED with above-mentioned donors or other institutional stakeholders. Finally, it examines the challenges that the Endowment is facing in terms of sustainability of political support and financing. The article examines the proposal, advanced by a number of Realist authors (Mearsheimer, Kissinger, Walt) that a lasting solution to the current crisis in Ukraine can be reached by a “grand bargain” between the West (defined as comprising the EU and US) and Russia. This settlement would mean that Ukraine gains the status of “a bridge between Russia and Europe”, pursuing equivalent relationships with both sides without formally becoming part of any competing arrangements (NATO, EU or Customs Union / Eurasian Economic Union). The analysis focuses on three main issues: the arrangement’s sustainability, its enforceability and its possible role in a broader Eurasian security architecture. It takes into account the ongoing dynamics of the Ukrainian society, regional evolutions, as well as the wider international environment. It also factors in the interests, perceptions and strategy of the current Russian leadership. In context, a brief comparison is made with the Finnish model, which is often invoked by the proponents of the “bridge” solution. The conclusions reached are that, in the current circumstances, a “50%-50%” type of arrangement could not be sustained with reasonable political, economic and military costs. Its enforceability would also be problematic, given the parties’ very different commitment to use the capabilities at their disposal. Taking into account the extremely high difficulty of reaching a mutually satisfactory settlement in Ukrainian case, which must be one of the linchpins of any Eurasian security architecture, it can be concluded that such a broad agreement is also extremely unlikely at this time. A more probable outcome for the near future would be a policy of “complex containment”, where economic and political interaction continues at some levels, but is restricted in others and where Russia is no longer perceived as a genuine partner of the West. This would not be a permanent situation, but only a temporary “point of balance”, highly dependent on political evolutions, especially those within Russia. This paper is focused on the relationship between the Republic of Moldova and the European Union. In a regional climate marked by the crisis in Ukraine, Moldova is an interesting case. It is arguably the most committed country in the Eastern Partnership to a stronger relationship with the EU. It is also the country that registered most progress in adopting EU policies. And, most of all, it seems the most likely country to challenge the “everything but institutions” principle that has shunned away any hope of EU membership for countries in the European Neighbourhood Policy. The paper will try to outline how the relationship between the Republic of Moldova and the EU has evolved, how the two sides perceive each other, what is the current status and what are the perspectives, while also pointing out to the regional and even international significance of this relationship. TOWARDS THE SUNSET OF EU-RUSSIA STRATEGIC PARTNERSHIP? This paper analyzes the future of the EU-Russia strategic partnership in order to observe that it is still viable for dealing with the actual regional and global challenges. The recent events in Ukraine have revealed the asymmetries between the two global players and an antagonism regarding the approaches to key political agendas as security, democracy or energy. In this context, the European Union’s relation with Russia seems to have reached a defining moment, both of them considering the policies of the other part as threatening its own political and economic interests. As this situation is unlikely to change in the foreseeable future, it is hard to affirm that the official partnership existing between European Union and Russia is also a de facto partnership. Moreover, this paper suggests that the European Union and Russia would further compete for influencing the common neighbourhood, competition that would decline their strategic partnership and would cause a gap in their relation. Even if is undeniable that Russia will remain a strategic player at the international level, in the current environment, the option of competition between EU and Russia seems to be the most viable for both players, fact that indicates the inoperability of their strategic partnership. However, the end of this paper provides an overview of the possible evolution of EU-Russia relationship in the future, stating that the interdependence existing between them would avoid a direct confrontation. 2014 can be considered a new turning point in international relations and EU studies, as it was overall a very politically engaging year, both for historical memory and for present times. First, there was the centenary of the beginning of the First World War. Second, it brought a brand new institutional reshuffling in Brussels. Following the May parliamentary elections, the EU appointed its new leadership for the next 5 years. And third, there was the spread of violence, insecurity and political turmoil in Ukraine, Gaza and Iraq/Syria. In this intricate context, all eyes are again on the EU and its capacity to face these geopolitical challenges. One of the biggest changes brought by the newly announced Juncker Commission is the way it has restructured the foreign policy component. Before the official announcement, when some of the Commission plans leaked the press, many were speaking about the possibility for the enlargement portfolio to be completely dropped off. In reality it was not, but the message is still not very encouraging for the Western Balkans. The aim of the article is to assess the main pros and cons referring to a possible disengagement of EU in the already delayed Europeanization of the Western Balkans. The main points to be taken in consideration are: the reasons for EU to take such a decision based on the limited progress of the countries, the foreseen impact of this decision in the next 5 years and the risks for a re-emergence of violence and instability in the troubled region. Two decades after the definition of its Common Foreign and Security Policy, the European Union could move forward in this field by planning and implementing the full integration of Intelligence into the core of its global and smart power design. An inception scenario could consider and eventually overcome Euroskepticism, Eurosklerosis, Eurozone meltdown, Sovereign Opt-outs or other negative trends. Three questions are envisionable on such premises: is it a matter of stronger political will to deepen the empowerment process in accordance to the official claims for a safer and grander unional Europe, capable to foster enhanced understanding and practice of its role in contemporary world affairs? Is it a matter of relevance to show that the EU is not just a bureaucratic form without content in the complex arena of International Security, or a fragile economic powerhouse with almost no coercive might? Is it a matter of urgency to validate its string of Treaties beyond the optimistic wording of social market economy and mutual assistance clause into the reality of preventive diplomacy and just resolution of classic or asymmetric risks and threats?